These are the rules for the Apex Legends (PC) 3on3 Open Cup #7 Europe. We make every effort to ensure the rules are complete and up to date but this may not always be the case. You should also check the Info Page and News for additions, exceptions and modifications that may apply. The rules are a guideline and the decisions by admins may differ from them depending on the circumstances. If you have any questions about the rules, please write a support ticket. Only a team which participated in a match can complain about the results in any way. All rules are subject to change without notification. You must be a registered player on the ESL website. You must have an active EA account in good standing and link it to your profile. If you do not meet these requirements, you will be deemed ineligible. Sign-ups will be closed for all cups 30 minutes before they start. If your team has not signed up before this time you will be unable to participate. Your team will also be required to check-in to the cup itself starting 30 minutes before the cup. ESL reserves the right to edit Nicknames and/or URL aliases. Team or player names that are too similar to that of another team or player are subject to be changed by ESL. For more information on team and player names, please refer to the ESL Global Ruleset section 3.1.2. “Nicknames, Team Names and URL Aliases.” If a team name has been wrongly seized, please file a support ticket with proof of ownership of the name. Only registered team members are allowed to play for a team. Playing in any matches with a ringer is prohibited. (See “Ringing/Faking” in the ESL Global Rules) Players and teams must compete under their officially registered APEX team names and Nicknames during all official matches. Team rosters must consist of at least the minimum amount of players required to participate in a cup. Teams are only allowed to play with players on their roster with a registered gameaccount. All roster changes must be made prior to the start of a cup. Playing with different players and/or illegal ringers will result in punishment. The team must play with their registered roster of 3 players for the duration of the whole cup. The roster must consist of 3 players from the list of eligible countries, specified on each cup page. All players must install the newest version of the game in order to participate in ESL cups. Updates must be installed before the cup starts, so delays will be at a minimum. Teams are responsible for their own technical issues (hardware/internet). Matches will not be rescheduled because of technical issues and matches will be played nevertheless. If the warm-up time in the starting area is exceeded the game goes on, even if the issue is not solved yet. In case of massive problems influencing a significant amount of players, a replay of the map may be called via the cup's support channels on Discord. The first teams to do their check-ins for each cup get to participate until the maximum amount of check-ins is reached. Slots will be available on a first-come, first-served basis beginning from the check-in process start 30 minutes before the start of the cup. To keep cups as efficient as possible, ESL reserves the right to disqualify teams. This will only be done in cases where a team purposefully stalls or attempts to block the cup from starting. The intentional use of any bugs, cheats, glitches, or errors in the game is strictly forbidden and will be penalized. Any team found to be using any known exploit will forfeit their game upon the first occurrence of the exploit. If the team is found to use another known exploit for a second time and it is determined to have been done on purpose they will be removed from the cup and barred from any future cups. 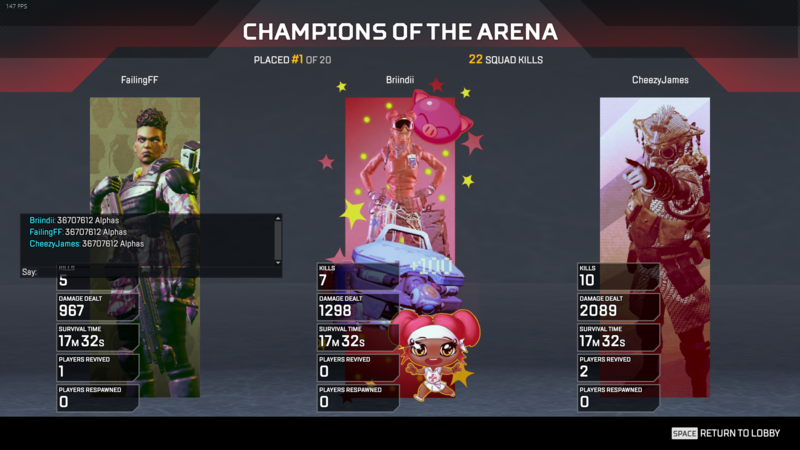 Each kill is worth 1 point. Each Win is worth 6 points. Please resolve any problems that might occur before a match starts. Connection or hardware problems during a match could lead to a disqualification by ESL admins. Make sure all players are eligible to play. In team games, all players must be registered for their corresponding team's roster. It is only allowed to substitute a player before the match starts. If the match is started all 3 players of a team must play the game until the end. It is possible to switch players in a Bo2 between the maps. A team is allowed to have 1 substitute player. In case of a tie in the results, the team with the most damage advances. If still tied the winner will be chosen randomly. Please submit a support ticket for any assistance during the cup. 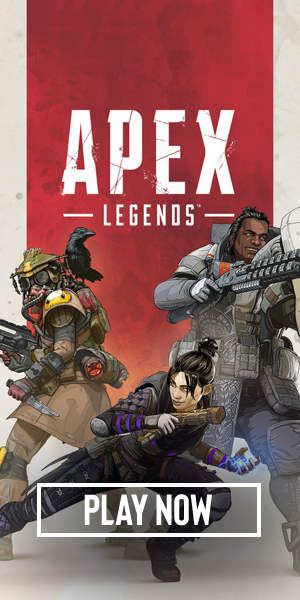 For communications, we ask teams to use our APEX LEGENDS Discord-server. Casting an ESL match is only permitted with an ESL admin agreement. Personal streaming is always allowed, for any other purposes to get an agreement please write a Support ticket. Personal Streaming is always allowed if ESL TV is not casting the same match. If ESL TV is casting a match, personal streaming is not allowed without an admin agreement. Personal Streaming of a match shown by ESL TV, without permission from an ESL admin, can lead to a disqualification of the team or ban of the participant streaming content during the tournament. Any such streaming by ESL TV will always be announced before match start.